Then, why, you ask, did I only give it a 3 Owl Rating? The ending. The ending was just too neat and tidy for my liking. In my opinion, just because a book is a stand alone, which Dark Energy is, I don't think it should have neatly packaged ending. I love a good messy ending. So here are all the things that I loved about this book. 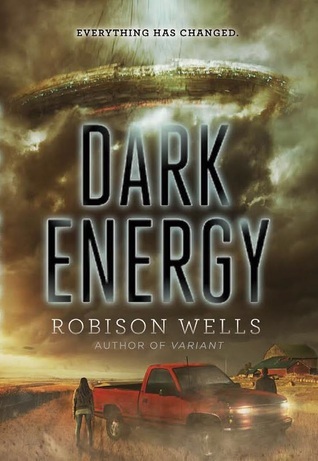 Dark Energy is smartly written, highly engaging, and fast paced. The dialogue between characters is flawless, especially between Alice and her father. As I was reading, all I could think about was how accurate and authentic the banter was between these two characters. I liked the mystery we got about the aliens that came to Earth. I liked how seamlessly the mystery revealed itself. One part of the puzzle I felt was pretty darn easy to solve, but how that puzzle piece fit in with the rest of the pieces was what stumped me. I enjoyed that the various discoveries made about the aliens were sufficiently creepy, and kept me wondering what was going to be revealed next. Also, Alice is Native American. I cannot say thank you enough to Robison Wells, for giving me diversity in books! I also really liked how Wells was able to juxtapose the plight of the Native Americans to the arrival of aliens. I thought that was pretty brilliant. After reading Dark Energy, I'm going to have to pick up some more books by Robison Wells, because I really enjoyed his storytelling. I have this book on my pile at home. I am really interested to see how this book is for me. I read his other series Blackout which I personally enjoyed. Great review!